A funny thing happened with those napkins on my “To Weave” list. I started out with one plan and ended up with another. But let me go back a bit. A couple months ago, I began purposely planning projects to use up some old yarn. I have some heavy cotton blend yarn in spring-like colors that were ripe for the weaving during those cold, snowy days. 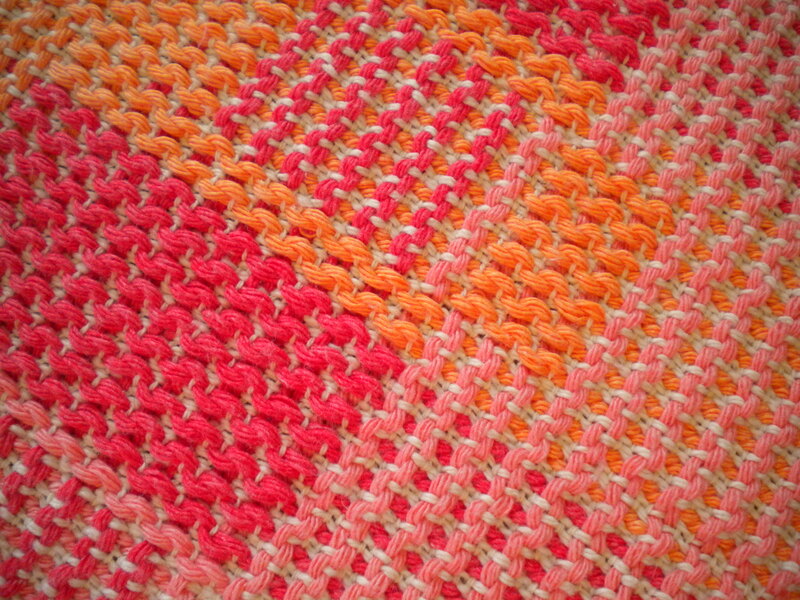 For the first project, I chose the medium orange (think tangerine), a perky red (strawberry–I see a theme here), and peach. The colors really do work together! They became color block placemats with an off-white cotton ground thread as the tie-down. As I weave placemats, I think about the napkins that should go with them. Not everyone uses napkins (my husband never seems to need one) but many of us need protection from our food. I’m speaking from personal experience here. And I like my napkins to at least pretend to go with my placemats. So when these placemats came off the loom, it was time to tackle the napkins. I don’t have light weight cottons in colors to match the placemats perfectly, but I have plenty of off-white on hand. To add a little sparkle, I alternated mercerized and unmercerized across the warp. 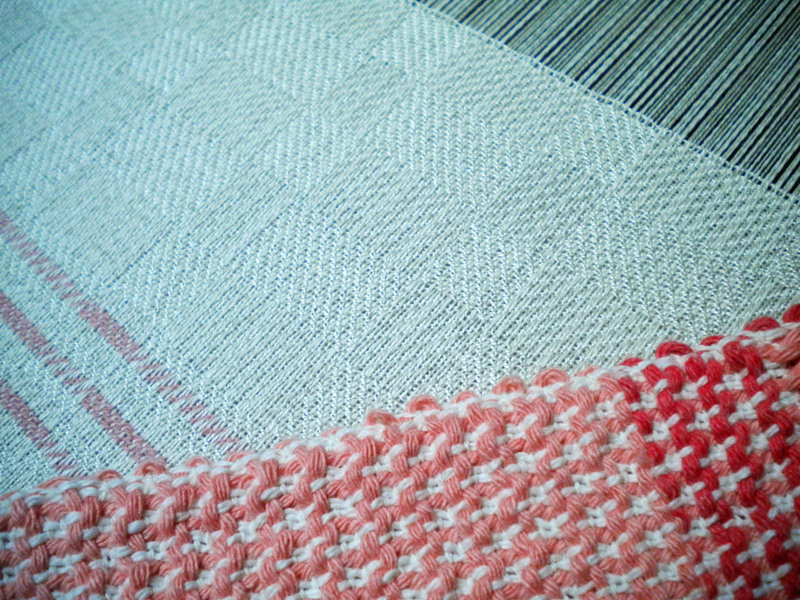 But I needed a weave structure that would play well with the bold blocks of the placemats. I turned to A Weaver’s Book of 8-Shaft Patterns edited by Carol Strickler (1991 Interweave Press). In the chapter on twill blocks, there’s a nice twill and basketweave combination that looked like it would work, but after threading the loom and weaving for several inches, I wasn’t so sure. I checked my tie-up, my threading, and my treadling for errors, unwove and rewove, but it still didn’t match my mind’s picture for my napkins. So I took a walk to consider what to do with 8.5 yards of off-white warp threaded for block twill. The obvious choice was to just treadle those twill blocks as they were threaded. Because I was using a 3/1 and 1/3 twill, the way the light hits the two blocks makes them look distinctively different, matt versus shine. The 10/2 cotton gives a nice hand to the cloth and with washing, will soften even more. I’m looking forward to seeing how they turn out after they are finished.